A truly awesome condo with super spectacular lake and mountain views. There are two master suites with king size beds, a high quality Bassett queen sleeper sofa in the living room, as well as an extra comfy queen sleeper in the loft. There's a third sleeper sofa in the bedroom on the lowest level. You can greet the morning with fantastic lake views from every one of these rooms. Dramatic architecture with massive beam ceiling, large windows, and four balconies. Elegantly furnished and appointed. There's a jetted tub in one master bathroom. This master bedroom also has it's own wood burning fireplace, so besides cozying up in front of the fireplace in the living room, you can also enjoy a fire in your bedroom. There are four TV/VCR sets. 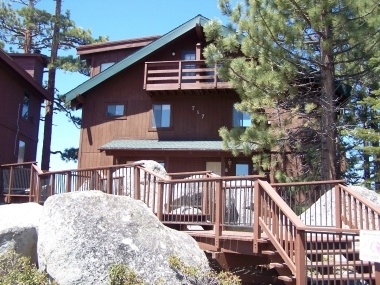 It's spacious and beautiful, a perfect mountaintop retreat that can sleep four couples on four different levels. For this mountaintop condo a four wheel drive is recommended in the winter. Please note: This home does require a 3 night minimum throughout the winter. Please call to check availability. This property has a wired internet connection, located in the loft bedroom.